MANILA, Philippines – The Professional Regulation Commission (PRC) released results of October 2018 Certified Public Accountant (CPA) board exam on Monday, October 22 or in six (6) working days after the exam. Aside from the full list of passers, top 10 and performance of schools, the commission is expected to announce the list of conditional or conditioned examinees. 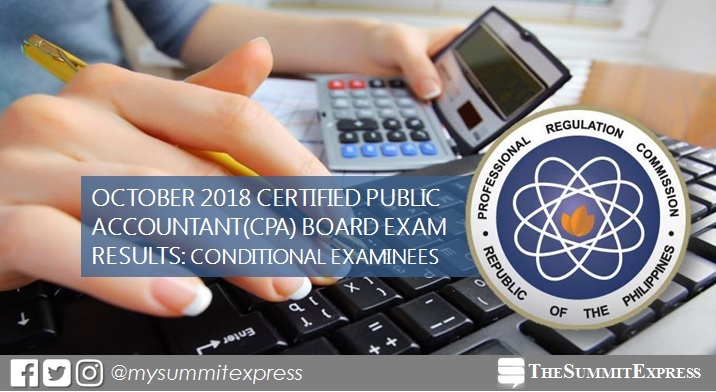 The second CPA board exam this year was administered by PRC and the Board of Accountancy (BoA) in the cities of Manila, Baguio, Cagayan de Oro, Cebu, Davao, Iloilo, Legaspi, Lucena, Tacloban and Tuguegarao on October 6,7 and 13, 2018. BoA is composed of Joel L. Tan-Torres, Chairman; Gloria T. Baysa, Samuel B. Padilla, Arlyn Juanita S. Villanueva, Thelma S. Ciudadano, Marko Romeo L. Fuentes and Gervacio I. Piator, Members. In the May 2018 CPA board exam, PRC announced the list of conditional examinees in few days after the announcement of list of passers. A total of 543 out of 9,830 (5.52%) fell to the conditioned category. Meanwhile, PRC did not release the conditional list of examinees in previous year's exam. For this case, we advise examinees to further verify with PRC Main or nearest regional office or this can be validated through the Verification of Rating (VoR) service of PRC. How to determine if you are conditioned? According to Republic Act No. 9298, an act regulating the practice of Accountancy in the Philippines: "to be qualified as having passed the licensure examination for accountants, a candidate must obtain a general average of seventy-five percent (75%), with no grades lower than sixty-five percent (65%) in any given subject." Provided, further, That if the candidate fails to obtain at least a general average of seventy-five percent (75%) and a rating of at least sixty-five percent (65%) in each of the subjects reexamined, he/she shall be considered as failed in the entire examination. NOTE: Some examinees made the mistake of taking a removal exam only on the subject with grade lower than 65. This cause the examinee to fail the removal exam.